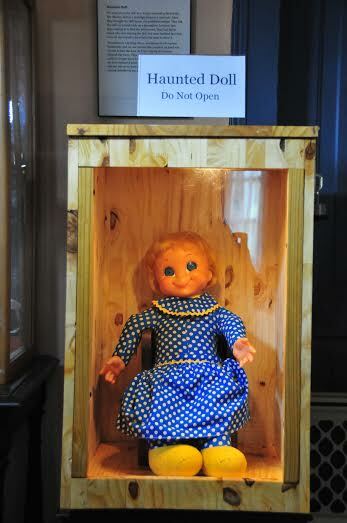 Our haunted object exhibit is where we showcase items that have residual energy attached. Some have emotions attached, some have more formless energy and some seem to react in a limited manner to the environment. We have a number of haunted objects that have been donated to the museum. The haunted dolls seem to capture the visitors the most. Here is the story behind one of our first acquisitions. We were given the doll by a family who had collected the Ms. Beasley doll as a nostalgia piece at a yard sale. After they brought the doll home, the problems started. They left the doll on a small table as a decoration; however they kept coming in to find the doll moved. They had fights about who was moving the doll, but soon realized that they were all too scared to have been the ones to move it. Sometimes it was lying down, sometimes it was turned backwards, and on one memorable occasion its head was turned to face the door so it was staring at whoever entered the room. They gave the doll to us as they felt they could no longer have it in their home. Since we have had it, we have noticed it seem to be in a different position then it was set, but as we have people in and out of the room we cannot definitively say anything yet. We plan to put a video on her now that she is confined to the box to see if we can find any movement. By Holly in Ghosts, Haunted Objects on August 23, 2015 .